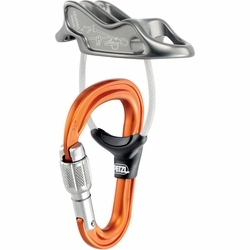 Petzl UNIREVERSO Belay Device. The UNIREVERSO is a complete and lightweight belay system that is particularly practical to use and effective on all rope diameters. This system is composed of a REVERSO 4 belay device and an ATTACHE locking carabiner, held in optimal position by a sliding link. The unit is loss-resistant and reliable. This belay-rappel system is versatile and allows adapted braking.